We were back recently at the hospital not so much for the scheduled regular check-up (after the second open heart surgery last February) but, to write another line about the goodness and wonderful gift of our FATHER in healing my husband, in our family storybook, to be read, even by those who need to find HIS Love-manifest. This family storybook to be kept here and remembered even beyond this material world. As a person I tend to be reserved and private, I'm not one who frequently posts photos especially of my family, on social media except when it comes to sharing HIS Love. I asked myself several times when I snapped these shots, what's the use of keeping these photos ? Well they tell an incredible story of a hospital ward (cardiology) and ICU full of highly-specialized and brilliant medical teams, beautiful, extra-ordinary people, who performed their jobs professionally but never once heard anyone mention about GOD, much more the GOD Who heals. On the contrary I once heard a young doctor or intern say she doesn't believe that there is a GOD. 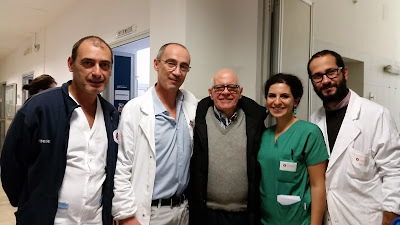 On this day, the heart surgeon acknowledged it was The FATHER Who wanted (in this doctor's own term 'voluto' in italian lingo) him (my husband) to live. 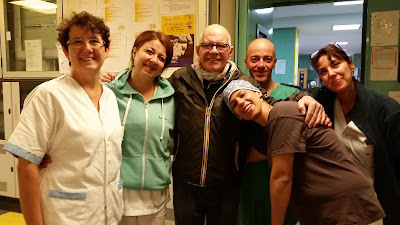 My husband stayed for two months in the cardiology ward and almost two months in the ICU and finally two months in the physical rehabilitation center between the months of February and July. The ICU ward of Umberto I Polyclinic Hospital of Rome is actually what I can consider a heaven of a medical workplace /environment because every nurse or doctor treats his/her colleague like his/her own sister/brother, with matching warm hugs and jovial kisses as if they haven't seen each other for a long time. More than that,they treat each patient like his/her own brother, and they relate to them as if they're not 'sick' or in the ICU as they always smile and make light encouraging jokes to uplift the patients' spirit, except that they have to carry on treating them in the sense of operating state-of-the-art medical life-support machines to cure the patients. They also talked to and updated the families of patients in both a kind and professional manner when it's visiting time. They perform their duties in a very coordinated manner, like , when it's needed they promptly send for specialists to treat the patient,even blood test results are obtained quickly. The truth that I want to drive through, is that through these experiences, I understand that healing is a process essentially initiated by GOD. As can be said, in 1 Corinthians 3:6 "I (Paul speaking) planted the seed, Apollos watered it, but GOD has been making it grow. So neither the one who plants nor the one who waters is anything, but only GOD, Who makes things grow. " If I may add,in my husband's health,it's only GOD Who makes things re-grow! GOD used these doctors and nurses in the process of healing,not that HE can't heal supernaturally which HE continuously does for us until now, but sometimes our faith doesn't measure up to HIS Heart ever Willing to make us well. In Matthew 13:23 "Then seed (The WORD) falling on good soil (heart) refers to someone who hears The WORD and understands it. This is the one who produces a crop,yielding a hundred,sixty or thirty times what was sown. So in this passage of the WORD of GOD (The Holy Bible) I realize even more this process of and. growth in faith and healing And so I think HE meets us at our own level,but never abandoning or forsaking.NEVER! Praise The LORD! It is human nature to show off what we have on the outside like materially, financially and status-wise and though I share the feeling, most of the time I realize, ultimately it's not what really makes you, or your life. It's WHO you know that makes you and your life. GOD BLESS you Tremendously. I hope you're blessed by my message today. Remember always, GOD Loves you so much that HE gave HIS Only Begotten SON that if you believe in HIM, you will not perish but have everlasting (John 3:16) He is as close to you as your own breath,as present as your own thought.HE is waiting to hear from you in prayer.